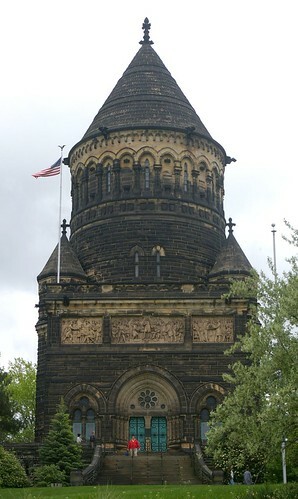 The Garfield Monument, in Lake View Cemetery is an imposing structure. A national competition was held to choose the best design. The winner was architect George Keller, of Hartford, Connecticut. 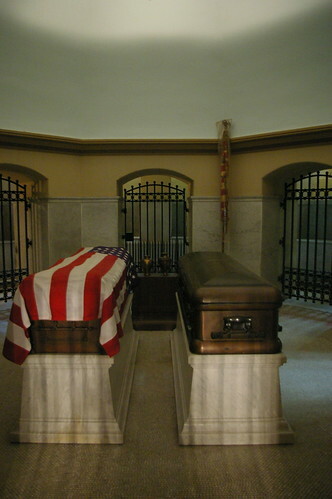 When you enter the monument, one set of stairs goes down, to the crypt, where James and Lucretia Garfield are buried. On the main floor stands an imposing marble statue of James A. Garfield. Exhibits detail his life. If you look up, the view is stunning. The bright-colored mosaics seem to glow in the light. From here, a set of stems lead upward. Being able to get closer to these works of art is as good an incentive as one might find. 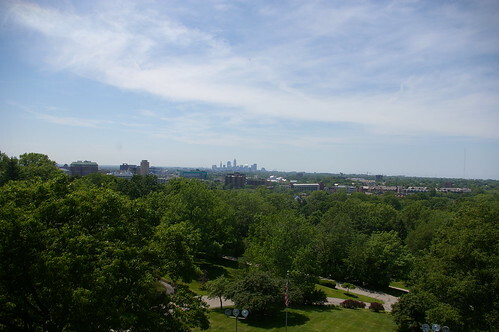 At the top of the steps one receives this reward: a great view of the city. The monument also includes murals depticing the life of James A. Garfield and a gift shop. This architectural monument is a true Cleveland treasure. While the the cemetery, you might also consider visiting Wade Chapel. 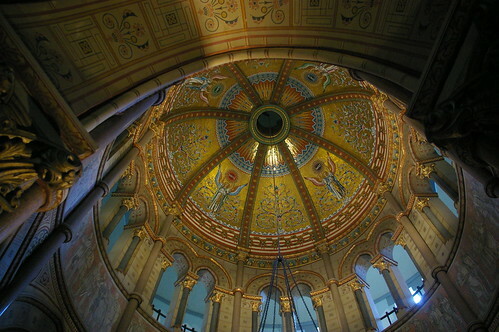 The entire interior was designed by Louis Comfort Tiffany, from the fixtures to the mosaic murals to the stained glass. Both are free and open daily. 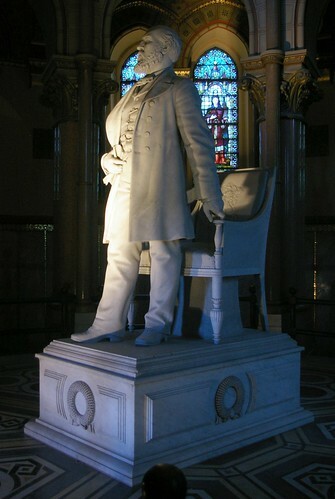 The Garfield statue was not originally intended for the interior of the rotunda & stands rather awkwardly there. You can even see by the floor pattern that the statue was introduced as an afterthought.